Stated Clerk, Presbytery of St. Augustine . "Before the Angels," "Saving One's Life," "Carrying One's Cross," The Jesus Database, an online annotated inventory of the traditions concerning the life and teachings of Jesus. Dr. Gregory C. Jenks, FaithFutures Foundation. "No men do more harm to themselves, than they that love themselves more than God." "A true disciple of Christ is one that does follow him in duty, and shall follow him to glory." "Should we not consider all crosses, all things grievous to flesh and blood, as what they really are, as opportunities of embracing God's will at the expense of our own?" The Important Question (Matt 16:26). Sermon by John Wesley. "Religion is the love of God and our neighbour; that is, every man under heaven. This love ruling the whole life, animating all our tempers and passions, directing all our thoughts, words, and actions, is 'pure religion and undefiled.'" "If a man makes the present world--in its various forms of riches, honors, pleasures, and such like--the object of supreme pursuit, be it that he gains the world; yet along with it he forfeits his own soul." "Christ saw in the words of Peter a suggestion not so much of his as of Satan's. It was a temptation to shrink from the work for which he came. It was the same temptation that called out from him the same rebuke once before." Commentary, Matthew 16:21-28, Mitzi J. Smith, Preaching This Week, WorkingPreacher.org, 2017. "Matthew 16:21-28 and Work,Theology of Work Project, 2017 (scroll down). "Taking Up My Cross...Hearing This Invitation Like It Is the First Time," Janet H. Hunt, Dancing with the Word, 2017. "Throwing Away Your Life," Glenn Monson, Law & Gospel Everywhere. Commentary, Matthew 16:21-28, Eric Barreto, Preaching This Week, WorkingPreacher.org, 2014. "Facing Toward Jerusalem," Nancy Rockwell, The Bite in the Apple, 2014. "I have used this example as a way to consider why it is that sometimes we don't 'pick up our crosses' to follow after Jesus. Can you think of other excuses we might use?" Commentary, Matthew 16:21-28, James Boyce, Preaching This Week, WorkingPreacher.org, 2011. "The kingdom is becoming present in that resurrected life of the Messiah in each of our communities where this confession and life are bound together in the responsible exercise of love and mercy for the world." "It does no good for preachers to rehearse Jesus’ extreme demands while congregations sit in well-cushioned and air-conditioned sanctuaries. Preachers must level with our congregations. Precious few of us lay everything on the line for the gospel, but neither can we ignore its call." "The Good News about Being Lost," Fr. Rick Morley, a garden path, 2011. "We should steep ourselves in this passage, and mindset, until we get to the point when we’re able to turn the old evangelical question on it’s head, and ask ourselves: Are we lost?" Jesus Foretells His Death and Resurrection, audio telling, story in episodes, graphic, audio and written commentaries. Go Tell Communications, Biblical Storytelling for the Global Village, 2011. "How long to sing this song?" Unvirtuous Abbey, The Hardest Question, 2011. "When everything seems so wrong, how do you speak up for what is right?" "This is the first inkling we get of Peter's complex character and of troubled waters ahead,"
Holy Textures, Understanding the Bible in its own time and in ours, Matthew 16:21-28, David Ewart, 2011. "Peter rebukes Jesus. Jesus rebukes Peter. Calls Peter - or at least Peter's rebuke - Satan. That is, Tempter, Snake in the Garden, Introducer of Hesitation, Mixer of Motivations, Flaunter of Red Herrings, Side-Tracker of Mission, Setter of One's Mind on Human Things. Well, fear of pain and death will do that to most people, and Peter was no exception." Comentario del Evangelio por Alvin Padilla, San Mateo 16:21-28, Working Preacher, 2011. Commentary, Matthew 16:21-28, Clayton Schmit, Preaching This Week, WorkingPreacher.org, 2008. Dylan's Lectionary Blog, Proper 17. Biblical Scholar Sarah Dylan Breuer looks at readings for the coming Sunday in the lectionary of the Episcopal Church. "As we follow Jesus, things will change -- us, our relationships, our world. Change means losing things as they were, but if we've caught Jesus' vision for how God is redeeming the world, we know that what we gain is of far greater value than the chains we lose." "Sometimes these texts have been expounded in a way that has led people to expect that they should not value themselves and that has led to a kind of inverse hypocrisy, where one parades before oneself that one is of no value - usually a lie and certainly a denial of the gospel. The true nurture of the self is to love ourselves as God loves us." "Our text is about the difficult task of following Jesus. Why do we do it? Why do we encourage others to do it?" 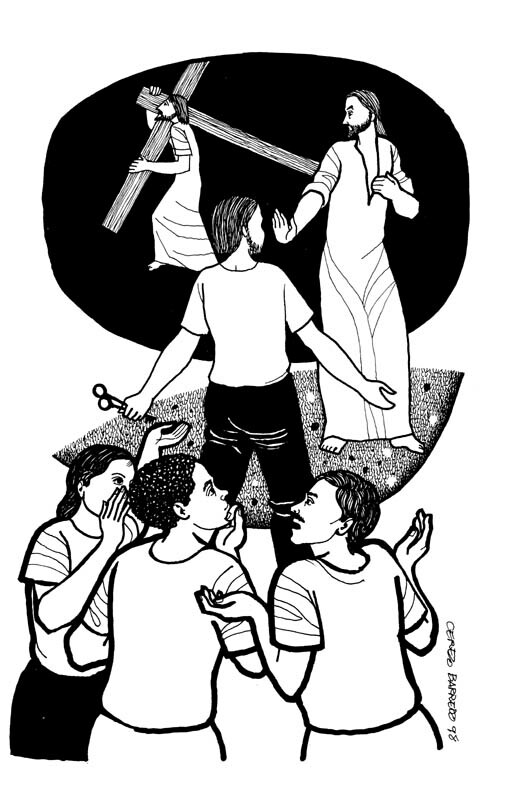 "Fifteenth Sunday after Pentecost: Matthew 16:21-26," Transformed for Disciple Community: Matthew in Pentecost, James L. Boyce, Word & World: Theology for Christian Ministry, Luther Northwestern Theological School, 1993. "Following the Crucified Lord," Rev. Bryan Findlayson, Lectionary Bible Studies and Sermons, Pumpkin Cottage Ministry Resources. Includes detailed textual notes. "Live for Tomorrow," Larry Broding's Word-Sunday.Com: A Catholic Resource for This Sunday's Gospel. Adult Study, Children's Story, Family Activity, Support Materials. "Why is it easier for us to focus on today than the future? Why do we make decisions for the future based upon today's needs?" "Our tendency is to do what we have been good at in the past -- to do it over and over again, even past its effectiveness...The call here is to recognize our tendency to back off from engaging larger thoughts that push us into what appears to be risks on behalf of a yet unfocused future." Wellspring of the Gospel, Ordinary 22A, Catherine McElhinney and Kathryn Turner, Weekly Wellsprings. Matthew 16:21-28, at Austin Presbyterian Theological Seminary's An Exegetical Study of the Common Lectionary, coordinated by Prof. John E. Alsup, features rough translation, disposition, immediate context, broader context, hermeneutical bridge, and contemporary address. "People today live in a dream world. We have it entirely too easy and too good to be bothered with death, ours and/or others. We need this texts Reality Check, regarding death and resurrection." Clark, John C., "Martin Luther's View of Cross-Bearing," Bibliotheca Sacra, 2006. Dahlberg, Bruce T., "The Typological Use of Jeremiah 1:4-19 in Matthew 13-23," Journal of Biblical Literature, 1975. Efird, James M., "Matthew 16:21-27, Expository Article," Interpretation, 1981. Krentz, Edgar, "Living Faithfully - Nevertheless," The Christian Century, 1996. Langle, Deanna, "Defining Moment," The Christian Century, 2005. Stoutenburg, Dennis C., "'Out of My Sight! ', 'Get Behind Me! ', or 'Follow after Me! ': There Is No Choice in God's Kingdom," Journal of the Evangelical Theological Society, 1993. "The Way to Life Goes through Death," Sigurd Grindheim, Trinity Evangelical Divinity School. "The Good Life," the Rev. Dr. Gary Charles, Day 1, 2005. "Finding Life," 15 Pentecost - 28 August 2005, Walter W. Harms, Göttinger Predigten im Internet: Every Sunday Sermons based on the RCL by a team of Lutheran theologians/ pastors. Take up your cross, Leah Thompson, CSSPlus. "The Whistle," Charles Kirkpatrick, Sermons4kids.com. "Jesus Tells the Disciples that He Must Suffer," Sunday School Lessons: Family Bible Study, art projects, music, stories, etc. "Building for the Present," Tom Woodley, dramatix. "Looking Out for Number One," Erina Caradus, dramatix. Clip Art, Matthew 16:24, Fr. Richard Lonsdale, Resources for Catholic Educators. Matthew 16:21-28, at Cerezo Barredo's weekly gospel illustration. Liberation emphasis. Matthew 16:13-20, Scripture Pics - graphics relating to RCL texts, Matt Baker, Germantown UMC, Ohio. Hymns with Scripture Allusions: Matthew 16:24, 26, 27. The Cyber Hymnal. "Take up Your Cross," "The Way," Brenton Prigge, NewHymn, a new, relevant hymn set to traditional tunes.